You'll find the very best British Columbia has to offer at Bear Mountain Ranch and Resort - wildlife, mountains, forest, great fishing, a waterfront resort, fishing boat, canoe, mountain bikes, peace and quiet in a country setting. 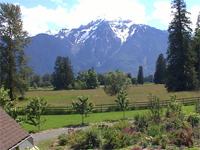 Nestled amongst majestic maples, located minutes from Harrison Hot Springs. Bear Mountain Ranch and Resort is becoming known for its romantic setting, is a great wedding spot complete with honeymoon suite, yet has accommodated small business retreats and seminars.